I was asked to make a cake to match the shower invitations, which were light blue with a polka dot border in blue, green, yellow, and white. 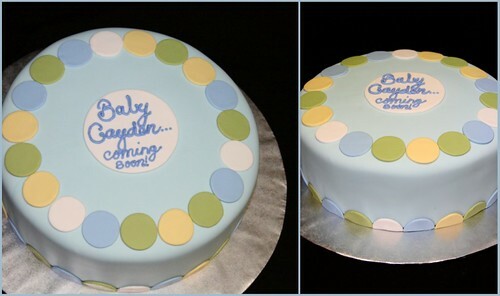 My plans were to frost the cake then add circle fondant appliqués. But I've learned that simple graphic design means the slightest imperfections are magnified. So, rather than struggle to achieve a perfect coat of frosting, I frosted the cake as smoothly as I could and I covered it in pale blue fondant. I then mixed the other colors to match the dots on the card. I cut the dots using a cookie cutter. They looked perfect...until I tried picking them up. They kept stretching out of shape. So I let them sit a while until they stiffened a bit, then I gently lifted them and placed them on the cake. I intended to create concentric rows of dots, but the diminishing circumference meant that the dots didn't align properly. So I went with a single row around the top of the cake. 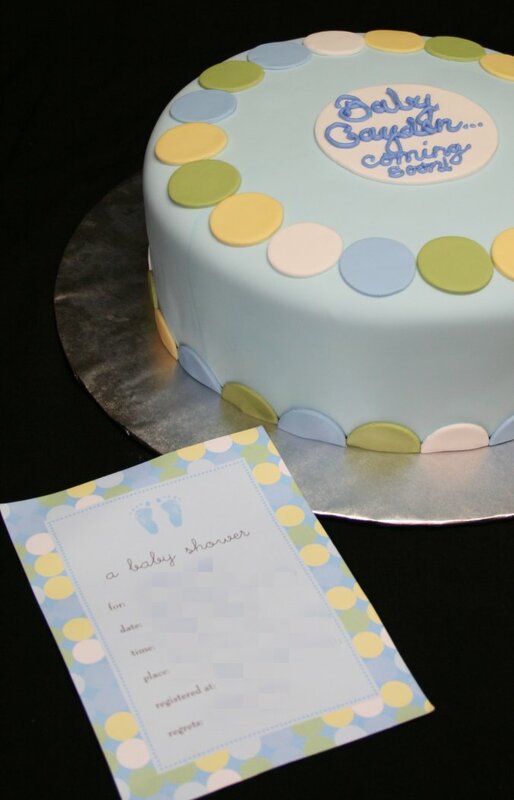 I cut a large circle of white fondant for the center plaque and mixed some frosting and piping gel with blue color to pipe the personalized message. The cake itself was three 10-inch rounds made using the white almond sour cream recipe, but instead of using white cake mix, I used French vanilla. It tasted wonderful. I filled the layers with Bavarian cream filling. I frosted the cake with white butter cream frosting. The fondant was vanilla flavored. I was told that everyone thought the cake looked great and was delicious.